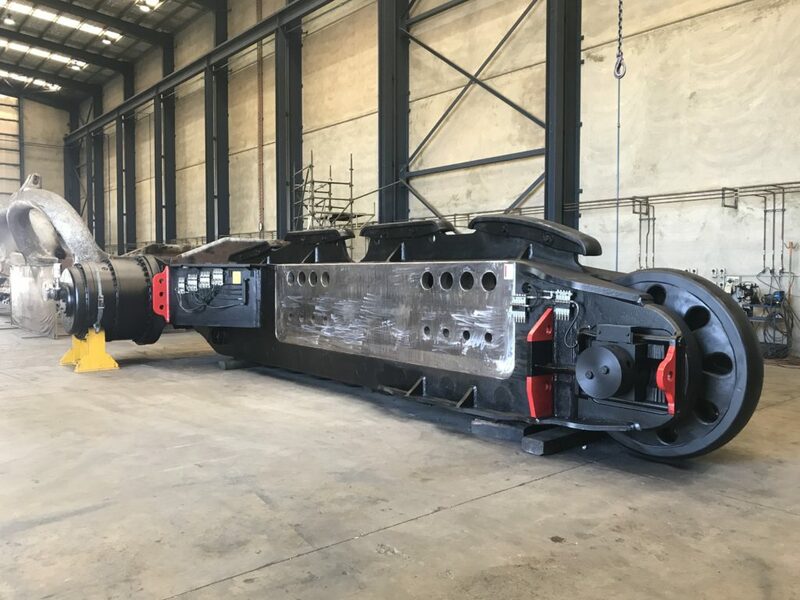 As part of Glencore Clermont Coal’s 4100 XPC Electric Rope Shovel September shutdown, Mainetec completed the refurbishment of both the left-hand and right-hand track frames at the Mackay workshop. Both the 87,000 kg track frames arrived completely assembled. The track frames were completely stripped and non-destructive tested. QA dimensional checks were taken of all bores, mounting face, shear ledge and dowel holes. Once all crack repairs were completed all lower load roller and rear idler bores and face were reclaimed back to OEM spec. The left-hand track frame had the transmission removed for an overhaul and refitted all within the turnaround period. On completion the track frames were reassembled with all new parts supplied free issue from Clermont Coal. The lube system was also removed and replaced with new. All QA was recorded, compiled and supplied to the client in a comprehensive format on completion. Mainetec also supplied onsite technical support for the duration of the shutdown. Mainetec was given a maximum turnaround time 19 days, however the right-hand frame was returned to site after seven days and left-hand frame after 10 days, exceeding site expectations on the turnaround. The works were completed 100% incident free. Mainetec utilised its highly skilled workers to execute the work on time along with a local lineborer who was able to reclaim all of the bores and faces in record time. Mainetec also designed, fabricated and certified transport stands for the track frames so they could be safely loaded and transported into Mainetec’s Mackay facility. An overhaul of this particular type of track frame was a first for Mainetec however many of Mainetec’s personnel have had previous experience working on these types of machines for the OEM and other repairers.